A summary of anarchist activities in the Hackney area in the late eighties and throughout the nineties. In the past twenty or so years Hackney has acquired what’s possibly the largest concentration of Anarcho types in the UK. The London Borough Hackney’s Labour council is largely to be thanked for this. Their inefficient and poorly managed housing department and lack of resources have ensured that several thousand homes are always left empty. The corruption and complacency of Hackney’s Labour Party is a clear manifestation of the failure of the country’s “democratic” system. The only viable opposition is coming from radical action outside of the establishment. The infamous and murderous activities of the Stoke Newington Police are an obvious demonstration that the state is not interested in maintaining a harmonious community but in criminalising and oppressing those at the margins of mainstream society. A decade ago Anarchists from Hackney were involved in the anti-apartheid campaign and anti-racist issues, the riots at Wapping (which turned a lot of people off non-violence) and squatting actions. Animal rights issues have been of consistent interest, with actions against fur shops, the anti McDonalds campaign, hunt sabbing, the live exports protests and other more underground activities receiving considerable support. 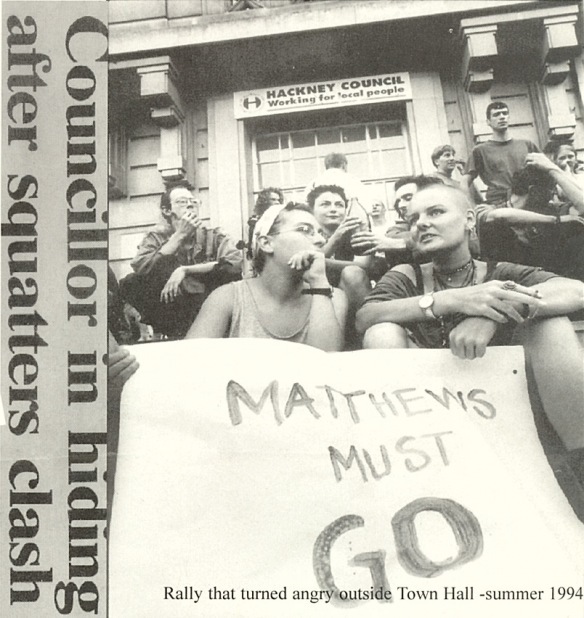 In the second half of 1987 what became labeled as “Hackney’s Squatters Army” disrupted every monthly council meeting demanding an end to evictions while 3-4,000 council homes remained empty. Links were developed with unions, while direct actions were carried out, such as against workers attempting to steel plate empty fiats. A squat centre was opened on Northwold Road. N16, a minibus purchased and a fairly well organised network established. By March 1988, with over 120 flats squatted on the Stamford Hill Estate alone, the council brought in riot cops to attempt a mass eviction. After a three day stand off, with burning barricades, hundreds of masked squatters and local supporters, the estate was finally lost. The Town Hall was again invaded and the former Salvation Army Hostel opposite occupied as emergency accommodation. Brynley Heaven, the Chair of Housing, was hounded out of Hackney and squatting continued to increase. At the end of 1988 there were weekend gigs and parties at the squatted Club Mankind, Hackney Central and Lee House in Rectory Road N16 was occupied as a cafe/ bookshop/ meeting space and an unforgettable 7 feet half pipe skateboard ramp! Support continued for outside issues with Hackney Anarchos making lively contributions all the main demos, the Troops Out campaign, the development of the Hackney Community Defence Association and the annual “We Remember” marches in respect of all the people killed by Hackney police. The Hackney Solidarity Group was formed and the controversial “Hackney Heckler” published and distributed free throughout the borough. A few weeks later there was not surprisingly a massive contingent of Hackney rent-a-mob at Trafalgar Square taking the cops on and smashing up the West End. Police raids followed and a number of Hackney Anarchos ended up in jail. Andy Murphy, a Class War member who had appeared on television, was suspended from his council job (but later reinstated). The following year the council launched a new campaign against squatting using PIOs (Protected Intended Occupier forms). Holmleigh Road estate, N16, which had for years been a hotbed of Anarchist activism including the Rock against the Rich tour, Hackney Solidarity Group etc was evicted. Hackney has always had a number of combative anti-fascists. Activists from Hackney have been involved in confronting the fascists: in the Kings Cross area and at the annual Remembrance Day commemorations, thwarting the Hitler’s birthday celebrations at Hyde Park in 1989, closing down Nazi shops in the West End, the Battle of Waterloo Station in 1992, and at Hoxton Market, Brick Lane, in the fighting at Welling (formerly home of the BNP headquarters) in 1993 and challenging the BNP on the Isle of Dogs. There have been numerous squatted party spaces, in warehouses, factories etc. as well as more serious centres such as at 149 Amhurst Road and the Neville Arms. Support has been given to industrial disputes, occupations and actions against cuts in services. In 1988, several libraries were occupied and kept open until they were finally evicted. In 1993, the same happened with various wards of the University College Hospital. Hackney has a thriving cultural scene (see over!) with lots of bands, sound systems and party organisers. An estimated 30,000 people attended the last Hackney Homeless Festival in Clissold Park in 1994 despite obstructions by the council. Naturally, Hackney produced a lot of opposition to the Criminal Injustice Act with active participation in the different actions and demos culminating in the Hyde Park riot in 1994. In 1993, the council started a vicious anti-squatting campaign in Hackney, leading to the destruction of many communities. The heavily squatted Pembury Estate, where a feeling of togetherness between tenants and squatters prevailed, became one of the first causalties. In 1994, the council managed to evict Glading Terrace, Church Crescent and the Spikey Thing with Curves (the old Salvation Army building empty again) in Mare Street. Large numbers of former squatters also began taking up offers of council tenancies on “hard-to-let” estates (for good or for bad). Hackney Anarcho types had been involved in direct action concerning environmental issues for years and have notably been present at the road protests, in particular the long running M11 campaign and the 1995 Reclaim the Streets actions. New centres have been squatted, the New Pigasus, 75A Mildinay Park, which lasted over a year and provided a vegan cafe, creche, video and poetry nights, circus nad meeting space etc. and the current squat cafe in Stoke Newington. At the beginning of 1996, the former North London Magistrates Court was squatted to provide accommodation for refugees. As well as combating the government’s racist immigration measures (by means of the autonomous refugee centre ARCH), another issue that is being taken up is the proposed introduction of the Job Seekers Allowance. Text accompaning the Timeline in the Hackney Anarchy Week Programme. From the Radical History of Hackney website.